Editorial update: Apple has reached out to us, and clarified that while there is no date set in place for the opening, fans can look forward to an official announcement when the time comes. Back in July, Singaporeans were thrilled by the news that our very first Apple retail store was set to open in November at Orchard Road’s Knightsbridge Mall. With Apple products only available to Singapore dwellers via authorised resellers (Nübox , EpiCenter) and Apple’s online store, the opening comes as a very welcomed surprise to both Apple fans and tech enthusiasts alike. The facade of the store, albeit still very much under renovation, was also observed by local Apple blog My Apple Singapore to potentially have the trademark front-facing glass panels that international Apple retail stores possess. 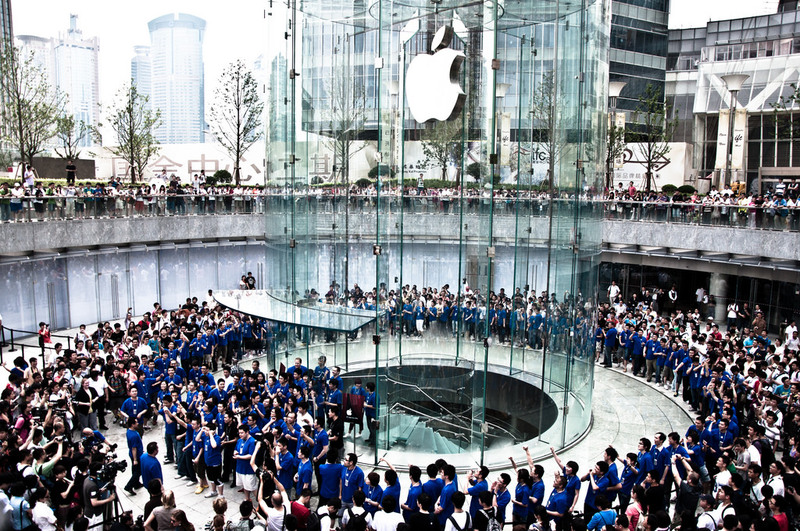 What was also exciting, especially to us, were the possibilities of how an Apple retail store in Singapore would turn out, given that the company is known for designing its stores so as to “become one with the community [it is in]”. And it’s not just in the superficial – Apple stores in Japan are also known to participate in the Japanese New Year’s Fukubukuro (“lucky bag”) tradition, giving out bags containing random Apple products at highly discounted prices. At that point of time, we were a mere few months away from the unveiling of a shiny new store which could, pardon the reference, make shopping in Singapore great again, but the projected date (and month) has already come and passed…and we’re still far from picking out Apple products over the counters. Last month, The Straits Times came bearing the bad news that the store “will likely not open in time for Christmas this year”. The information board at the location showed an updated expected completion of Jan 30, 2017, and comes as a 3-month delay from the previously stated Oct 31, 2016. The store was also observed to be “still covered by white construction hoarding, with construction canvas draped over the exterior’s glass panels” – not exactly the most promising sign. 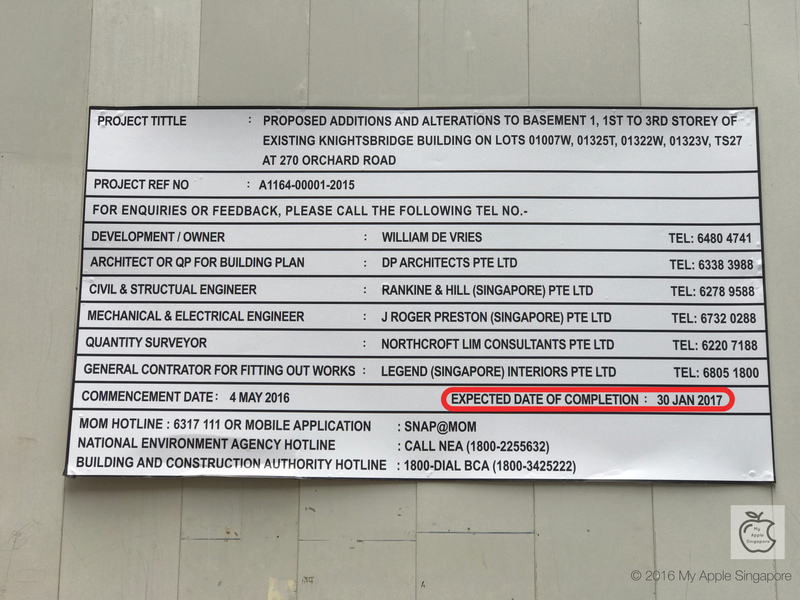 According to a report from Channel NewsAsia last week, the date has now been covered up, making the date of completion pretty much indefinite. After a check with workers and security guards at the site, the report found that the delays were “unavoidable after the site was issued with a three-week stop-work order in late October”. This was confirmed by the Ministry of Manpower (MOM), which revealed that the order was meted out on Oct 24 due to “unsafe conditions relating to work at height, traffic management, scaffolding, electrical installation and lifting operations that were observed during an inspection at the worksite”. Was The First Predicted Date Of Completion Too Optimistic? Given that a 3-week delay would’ve definitely caused a break in construction, the pushing back of the date of completion not once, but twice, might suggest that the first predicted date of completion (Oct 31) might have been a stretch in the first place. 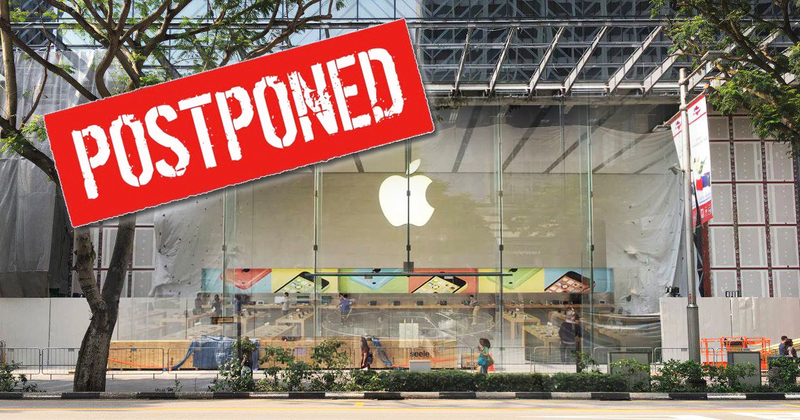 But then again, I’m no construction expert or engineer, and according to industry observers that Channel NewsAsia interviewed, delays “are not uncommon [given] Apple’s emphasis on customer experience in its flagship stores”. Regardless, I do hope that the site is now much safer for the workers (given that this year has seen a rise in workplace deaths, and is an issue we shouldn’t ignore anymore), and that we also get an update soon. And this time, a more accurate one.